Although Rolex has had an Internet presence with their company website, Baselworld 2013 marks an impressive upgrade to Rolex’s presence on Facebook and in social media. Starting on April 18th, the Rolex Facebook is supplying Facebook using Rolex fans with images, discussion, and history not found on Rolex’s company website. With over 442,000 likes in less than a month, Rolex might find Facebook its most important Internet offering yet. One of the nice aspects of Facebook is having updates to your daily feed from watch manufacturers, watch bloggers, watch publications, and now, from Rolex. By liking the Rolex Facebook page at https://www.facebook.com/rolex, Rolex news and model updates will be part of your Facebook monitoring ritual. For years, Rolex shied away from social media, but like its slow entry into the Internet, Rolex has slowly made a presence on Facebook. Rolex trepidation on entering Facebook is noted on its “House Rules” page listing how to behave on the Rolex Facebook page as well as locating commercial and after-sales service which are clearly outside of Facebooks’s purpose. Rolex utilizes Facebook’s functionality and qualities well. Rolex has no shortage of marketing images, and rather than bulking up the company website at www.rolex.com, Rolex posts plenty of studio quality marketing images and links to its YouTube channel on their Facebook page. It is clear that Rolex’s company website is their formal presentation on the Internet (similar to entering a Rolex Authorized Dealer) whereas Rolex’s Facebook page is certainly less formal by allowing interaction/comments from Rolex fans. Perhaps the best feature on Rolex’s Facebook page is their timeline. Facebook’s Timeline feature allows users to chronicle their images and stories in a historical format similar to doing timelines in 8th grade history class. Rolex utilizes Facebooks’ timeline to chronicle Rolex history from present all the way back to 1905, complete with images and quotes. 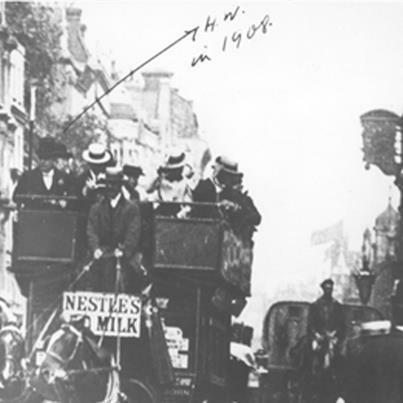 On devising the Rolex name, Rolex posts on their Facebook page a Hans Wilsdorf quote, “One morning, while riding on the upper deck of a horse-drawn omnibus in the City of London, a genie whispered ‘Rolex’ in my ear” complete with an images of Wilsdorf on this particular horse drawn bus. Rolex also has a separate calendar page complete with calendar quality images, and descriptions of the events Rolex sponsors in that particular month. To further stay connected to Rolex sponsored events, is the ability to drop events into your Google calendar with a click of a mouse. With Internet tools such as Facebook, Rolex has discovered a new method to connect with the people who buy their watches.